While I enjoy the perks of having a subscription it is hard to enjoy it when it is constantly glitching. The new update it is it working and even after I delete the app and re-install it. It continues to close before I have time to even see the screen to tap on an audio book. Not happy to pay every month and not be able to listen when I want too. The app keeps crashing whenever I go to the info screen for a book and I cannot download anything. App crashes whenever I leave my own library. Countless times I’ve downloaded a book and it will not play. It only allows to to download. I left the app for a while hoping maybe it would improve. It hasn’t. 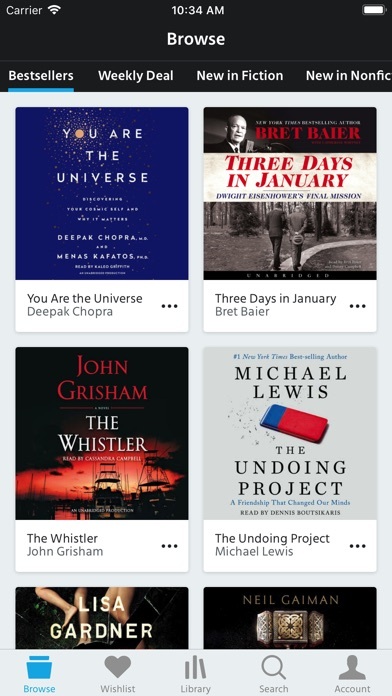 I’ll be using Audible from now on. It is beyond frustrating communicating with customer service having them tell you to just re-download with the same results over and over. want to access a chapter from a Table of Contents? You cannot. the list items are “tracks”, a music concept. they do not equal chapters, so you cannot count tracks to find your chapter. this is a huge oversight — maybe okay from a generic audio player. 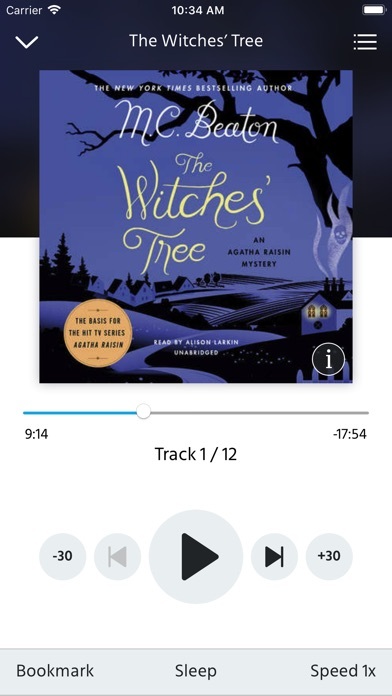 not acceptable from an Audiobook app. it’s doable: see libby app, e.g. use case: you buy a nonfiction/how-to/reference or self improvement book. you want to re-hear the chapter on “how to fix X”, because X is newly relevant. you cannot get to your chapter. because of DRM you cannot open the book you bought in a better app. pros: synch to other devices, speed controls, and an alternative to audible.com. The browse function is pathetic, just a sort of top 100, no breakdown of actual literary categories that you can go through. It didn’t have the title I was looking for but I found it on another app (not the one you’re thinking of). I did immediately stumble onto some LGBT “children’s” books that looked like political propaganda. Wow so progressive or whatever. Fantastic service, would be even better with an Apple Watch app! I love downpour! 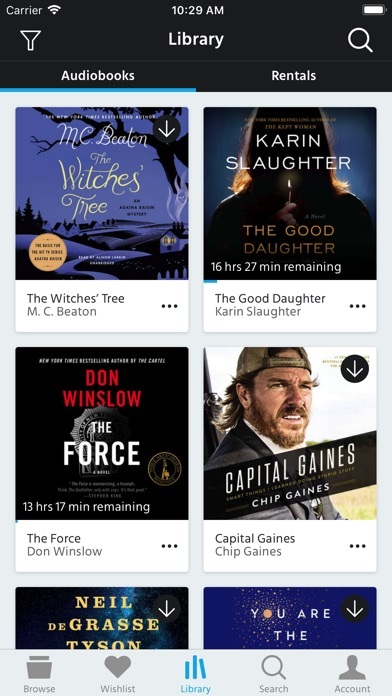 It allows me to keep all my audiobooks in one digital library without requiring me to have them all downloaded (which saves me lots of memory on my phone). 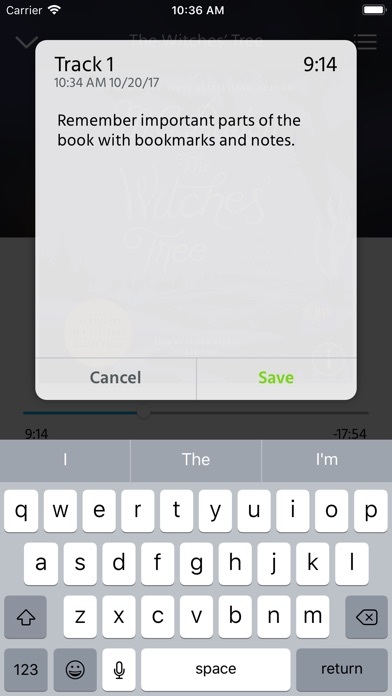 Endless options of audiobooks as well! Prior to the last update, I would have given this app a 3 star rating because you couldn’t purchase or rent any books from it...you still had to do those things through the website and then log into your app and refresh it to see the purchase/rentals on your bookshelf. Now that that functionality is available in the app, I’m upping my rating to 4 stars. However, I will not give it 5 stars until there is a compatible iWatch app. I want to be able to seamlessly transition from my phone to my watch without losing my place in my book...but right now I have to download the audio files to my music app in order to listen to my books while exercising...and then remember where I left off so that I can adjust the playback setting on the Downpour app when I get back to my phone. I will gladly update my review to 5 stars once an iWatch app has been developed.